come. After a very hot wait in the Panorama Lounge (the air conditioning was off in order to keep dangerous fumes from bringing our trip to a halt), we were called up to the platform. We walked and walked and walked – beyond the shelter of the train sheds – until we finally reached car 122, the second-last car on the train, where our accommodation for the next four nights would be found. We boarded the train, went to cabin ‘D’, and unloaded our stuff in this room that was slightly bigger than 5’x7’ (and occupied by two bunks by this time). No matter: we were on the train! We settled in, and as the train began to move, made our way to the rear car, Kokanee Park, where we would enjoy the first leg of the journey. My vow was that I would sit up in the dome until the lights of Toronto were but a memory, listening, of course, to Gordon Lightfoot’s Canadian Railroad Trilogy. I welled up a little at the realization that Diana and I were embarking on one of the world’s most legendary train trips. From this vantage point, we would see more than half of Canada, and meet people from across the globe. Diesel power: VIA 6440 (General Motors Diesel F40PH-3) in second-generation VIA paint, and VIA 6409 (same type) in VIA’s third-generation ‘Renaissance’ paint scheme. The scenery was predictable to us, only because we had travelled much of this journey by highway. 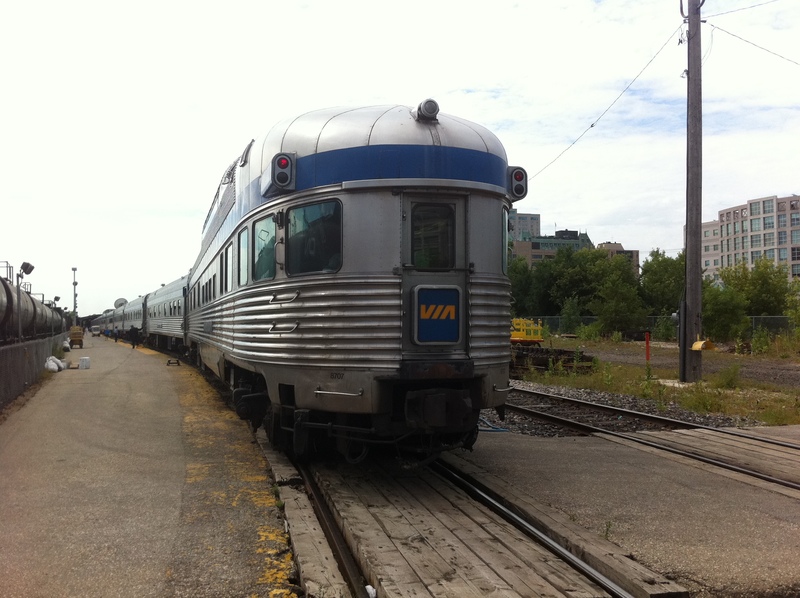 With the exception of the first full day through north-western Ontario, where the lakes, rocks and trees were the same but new to us, most of the time, the rails were quite near one branch or another of the Trans-Canada Highway. 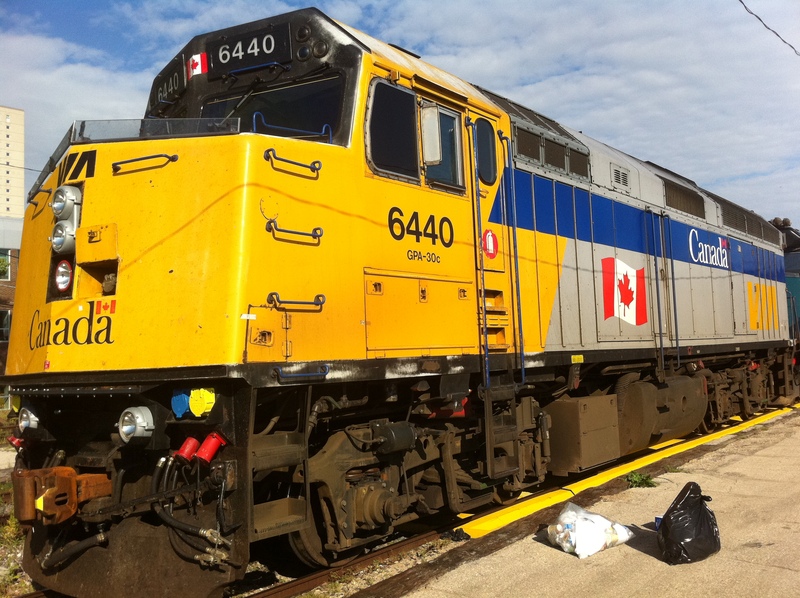 Because the journey takes place on Canadian National trackage, from Portage La Prairie on, the tracks followed the Yellowhead Route. never tire of them. “The firmament proclaims his handiwork,” said the Psalmist of our Creator God. Nowhere is that made clearer to us than in the mountains of western Alberta and British Columbia. Because the VIA journey ceased only for picking up and detraining passengers and crew, there was a lot of scenery that passed us by in the dark. But that would be atoned for when we heard the “All Aboard!” for the second leg of our journey, the Rocky Mountaineer. were short, for 5:30 Monday morning came calling all too quickly. Aboard the Rocky Mountaineer, we retraced our steps, this time in daylight, across the lower mainland, and up the Fraser Canyon to Kamloops. A night in a simple Kamloops motel was followed by another early morning that was met with as much anticipation as the trip itself, for on this day, we would ride only Canadian Pacific trackage. Not only would we see some of Canada’s historic and engineering feats, we would ride them. Even though we could not stop there, to be able to glide slowly past the wonderful cairn that marked the driving of the last spike that created Canada’s first transcontinental railway brought out not only Canadian, but Scottish patriotism as I said, “Stand fast, Craigellachie!”, in the spirit of Donald Smith and George Stephen, without whom the CPR may never have been completed. Sitting in the yard at Field, awaiting our turn at the Big Hill, was also a long-anticipated moment. For this time, we would not just stop at the roadside pull-off to look at the foliage eclipsing the lower portal of the spiral tunnels; we would be in it! Riding through a rocky cavern on a constant curve, then coming out, ascending, and riding through another rocky cavern on a constant curve, was amazing. The tunnels are shorter than they seem, but the grade they cut down and the lives they saved, since their creation in the early years of the twentieth century, reminded us of the ingenuity of Canadians. The greatest anticipation for me, and the only time I went to the vestibule to take pictures without glass between the lens and the scenery, came as I rose from my seat east of Lake Louise, and at mile point 113 on the Laggan Subdivision, started snapping pictures as we rounded Morant’s Curve. This is the most photographed piece of railway in Canada, and my plan was to take pictures of railfans taking pictures. Alas, there were no railfans there at that moment! But to say it was a near-spiritual experience to ride the rails around Morant’s Curve is an understatement. A brief stop in Banff was followed by the onset of darkness as we left the mountains for the foothills, thence for the lights of Calgary, where our rail journey of a lifetime would come to an end. The fun was not over, of course, for more great friends, the Woodwards, were there to meet us and delight us with four more days of conversation, sightseeing, and fun. Travelling home again by air might seem anticlimactic, but by then, we were ready for a shorter journey. The plane took off on time, landed early, and encountered no difficulty. A warm hug and a smooth ride home landed us into bed with a tiny bit of jetlag, and a lot of great memories to treasure for the rest of our lives. Make no mistake: we will see the good friends, and the scenery, many more times, God willing; whether we will do so by rail remains to be seen, but if that does not come to pass, we can say that we did it, without regret.